at the Al Trione Sports Complex at 8600 Whispering Pines Rd in beautiful Daphne AL! 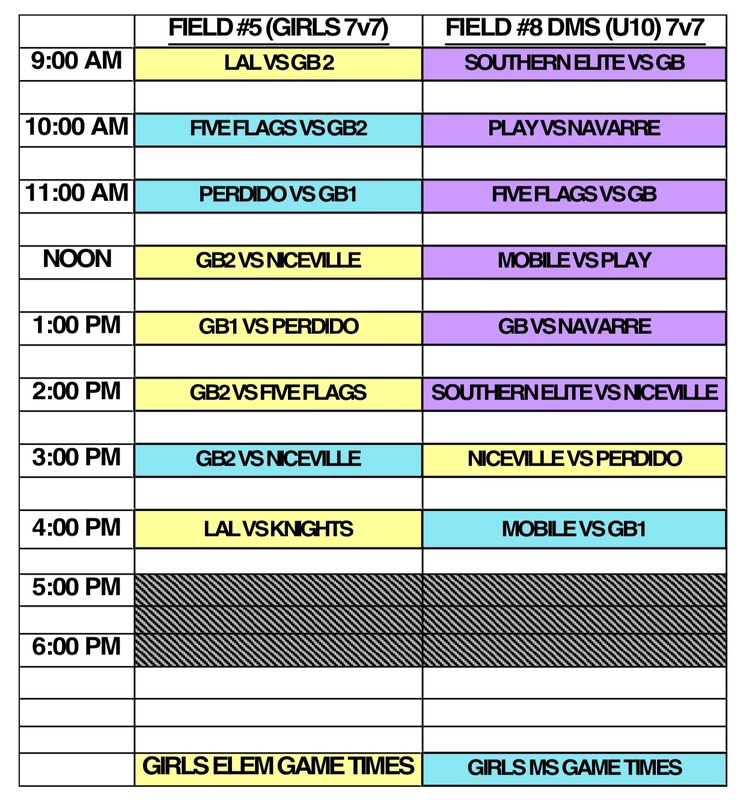 It is going to be the largest tournament we have hosted with 53 teams attending on Saturday!!! 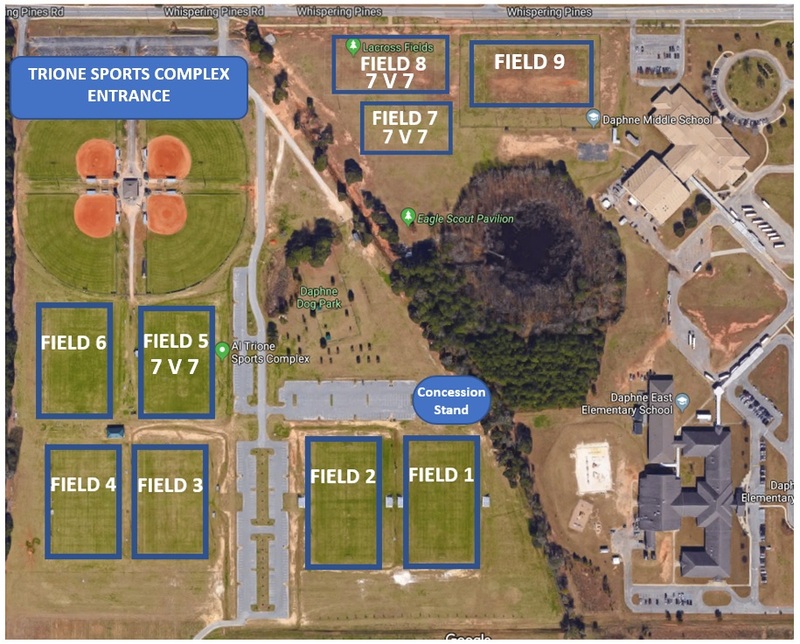 We have quality fields including two regulation size football fields with bleacher seating, and four soccer fields. the Trione entrance. The field layout below shows areas for assembling team tents. Parking lot is entered via Whispering Pines and there will be a $5.00/car fee to park. There should be plenty parking in the lots. LAL will have a tent near the concession stand selling our Jubilee Jam T-shirt for $15 and our new LAL stickers for $2. 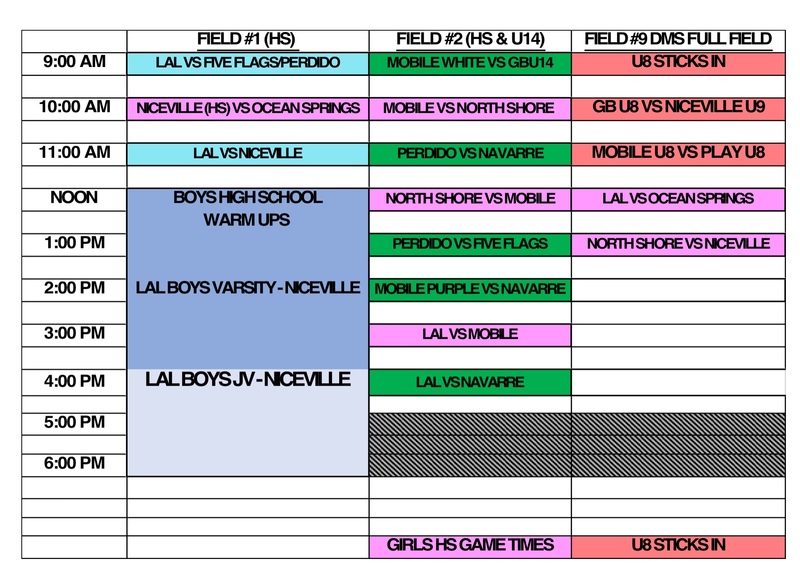 Our facilities will include full concessions both Saturday and Sunday located by field 1 where the football fields are. We assure you there will be plenty of good food to eat! 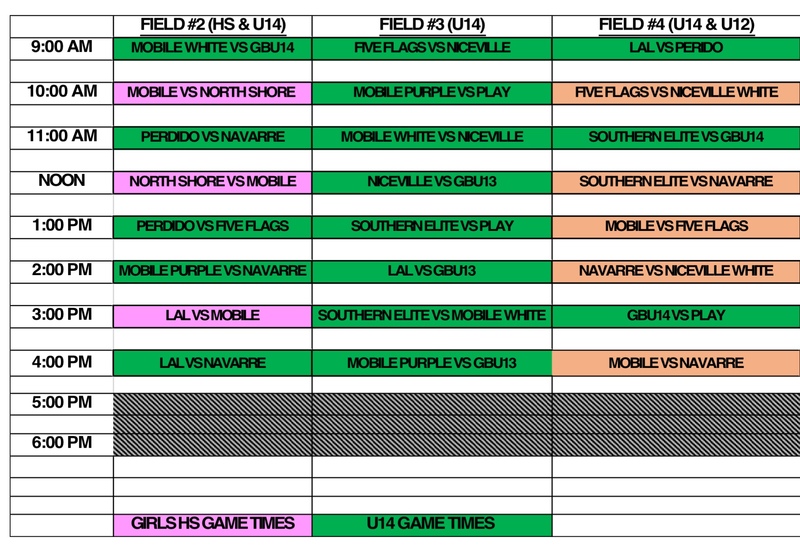 This is a 2-day tournament with bracket games and a Championship game on Sunday for U10, U12 and U14. team please remember to provide volunteers to help at the scoring & time keeping tables. Each team should provide one person to assist at scores table for penalty time and scoring and end ball retrieval as needed. out because it will affect our bracket games for those teams attending on Sunday. Please remember to lock your cars and do not leave valuables (wallets, cameras, laptops, etc..) in view and unattended. Trione is a public facility and LAL cannot bar access to park users outside the Lacrosse community. However, Daphne PD will be patrolling the facility on Saturday and Sunday per our request. Please be sure to bring chairs, umbrellas, sunscreen, etc.